haji abbas, M., Hosseininezhad, S. (2016). A robust approach to multi period covering location-allocation problem in pharmaceutical supply chain. Journal of Industrial and Systems Engineering, 9(special issue on location allocation and hub modeling), 71-84. Marjan haji abbas; Seyed Javad Hosseininezhad. "A robust approach to multi period covering location-allocation problem in pharmaceutical supply chain". 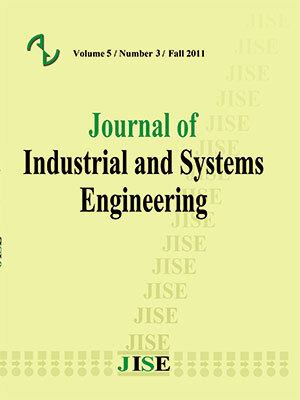 Journal of Industrial and Systems Engineering, 9, special issue on location allocation and hub modeling, 2016, 71-84.
haji abbas, M., Hosseininezhad, S. (2016). 'A robust approach to multi period covering location-allocation problem in pharmaceutical supply chain', Journal of Industrial and Systems Engineering, 9(special issue on location allocation and hub modeling), pp. 71-84.
haji abbas, M., Hosseininezhad, S. A robust approach to multi period covering location-allocation problem in pharmaceutical supply chain. Journal of Industrial and Systems Engineering, 2016; 9(special issue on location allocation and hub modeling): 71-84. This paper proposes a discrete capacitated covering location-allocation model for pharmaceutical centers. In the presented model, two objectives are considered; the first one is minimization of costs and the second one try to maximize customer satisfaction by definition of social justice. Social justice in the model means that we consider customers satisfaction by using distance. the introduced model is an extension of the maximum covering model by adding zone constraint that Actually the distance between facility and customer zone is categorized as best, possible and not possible location. The model tries to locate facilities in best and possible location. In addition, number of missed customers is important and the model considered this issue. Since the nature of the demand is uncertain, a robust approach is proposed. The model could applied to other industries that have limitation about their product such as perishability foods or other perishability product. The model solved by GAMS Software. Finally, a numerical example with sensitivity analysis presented to illustrate the proposed model. Alnaji L., Ridha M., (2013), "The role of Supply Chain Applications in Jordanian Pharmacies: A case study on Pharmacies in the capital city Amman," Industrial Engineering Letters, vol. 3, pp. 65-71. Ceselli A., Righini G., Tresoldi E., (2014), “Combined location and routing problems for drug distribution”, Discrete Applied Mathematics, vol.165, pp.130–145. Chen Y., Mockus L., Orcun S., Reklaitis G.V., (2012), “Simulation-optimization approach to clinical trial supply chain management with demand scenario forecast”, Computers and Chemical Engineering, vol. 40, pp. 82– 96. Costantino N., Dotoli M., Falagario M., Fanti M.P., Mangini A.M., Sciancalepore F., Ukovich W., (2013), “A hierarchical optimization technique for the strategic design of distribution networks”, Computers & Industrial Engineering, vol. 66 ,pp.849–864. Fleischhacker A.J., Zhao Y., (2011) “Planning for demand failure: A dynamic lot size model for clinical trial supply chains”, European Journal of Operational Research, vol. 211, pp. 496–506. Williams H.P., (2010), Model Building in mathematical programming. WILEY, london. Hosseininezhad S.J., Jabalameli. M.S., Jalali Naini S.Gh., (2013), “A continuous covering location model with risk consideration”, Applied Mathematical Modelling, vol.37, pp.9665–9676. Jabbarzadeh A., Fahimnia B., Seuring S., (2014), “Dynamic supply chain network design for the supply of blood in disasters: A robust model with real world application”, Transportation Research Part E, vol.70, pp.225–244. Jetly G., Rossetti C. L., Handfield R., (2012), "A multi-agent simulation of the pharmaceutical supply chain," Journal of Simulation, vol. 6, pp. 215-226. Kelle P., Woosley J., Schneider H., (2012). “Pharmaceutical supply chain specifics and inventory solutions for a hospital case”, Operations Research for Health Care, vol. 1 ,pp. 54–63. Masoumi A.H., Yu M., Nagurney A., (2012), “A supply chain generalized network oligopoly model for pharmaceuticals under brand differentiation and perishability”, Transportation Research Part E, vol. 48 , pp.762–780. Mousazadeh M., Torabi S.A., Zahiri B., (2015), “A robust possibilistic programming approach for pharmaceutical supply chain network design”,Computers and Chemical Engineering, vol. 82, pp.115-128. Mulvey J.M., Vanderbei R., Zenios S.A., (1995), “Robust Optimization of Large-Scale Systems” , Operations Research, Vol. 43, No.2 pp.264-281. Pitta D.A., Laric M.V., (2004), “Value chains in health care”, Journal of ConsumerMarketing, vol.21 (7) pp.451–464. Reinholdt K., Hansen N., Grunow M., (2015), “Planning operations before market launch for balancing time-to-market and risks in pharmaceutical supply chains”, Int. J. Production Economics, vol. 161, pp. 129–139. Shah N., (2004), “Pharmaceutical supply chains: key issues and strategies for optimization”, Computers and Chemical Engineering, vol. 28, pp. 929–941. Spiliotopoulou E., Boni M.F., Yadav P., (2013), “Impact of treatment heterogeneity on drug resistance and supply chain costs” , Socio-Economic Planning Sciences,vol.47 ,pp. 158-171. Uthayakumar R., Priyan S., (2013), “Pharmaceutical supply chain and inventory management strategies for optimization: A study on pharmaceutical company and hospital”, Operations Research for Health Care, vol.2, pp. 52-64.